During Construction works for the realignment of the R284 from Drumaskibbole to Ballygawley in County Sligo, Tom Rogers of Moore Group excavated a fulacht fiadh and two stone trackways (along with a number of assorted other features). This is part 2 of a 2 part post on the Drumaskibbole site. Part 1 is here. The excavation was commissioned and funded by Sligo County Council. 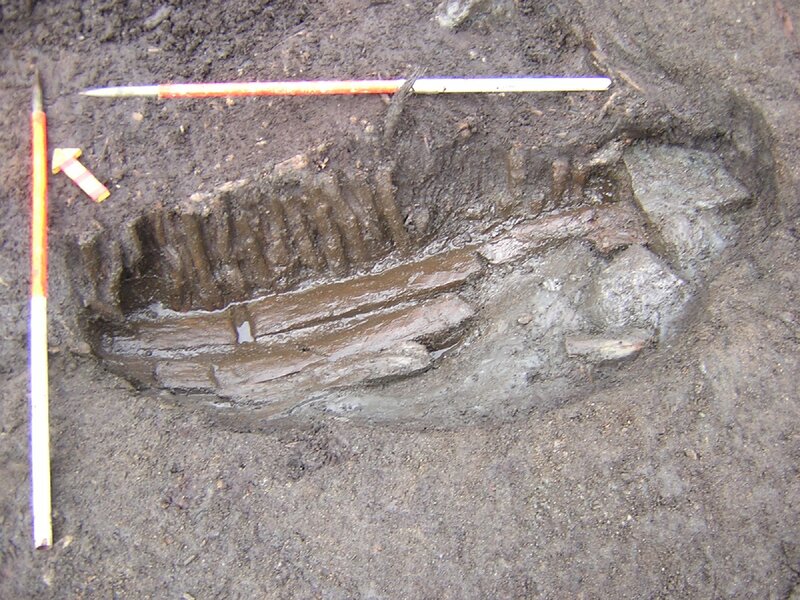 All remaining overlying peat was removed from the area of excavation by hand except for a small area where the original ground surface remained. Here a core sample was taken and the contexts recorded. These were as follows; C1 was topsoil and sod, a peaty brown soil with some clay elements held together by fine grass roots. Beneath this C2 was a 0.13m layer of soft grey clay with bright mottling from organic inclusions and some black phragmites fragments. Below this C3 was a well humified peat layer containing sphagnum and phragmites fragments and frequent roots. This context covered most of the site and was variable in depth gradually thinning to the south as the natural sands (C26 and C24) rose to the south. The site was cleaned, photographed and recorded. 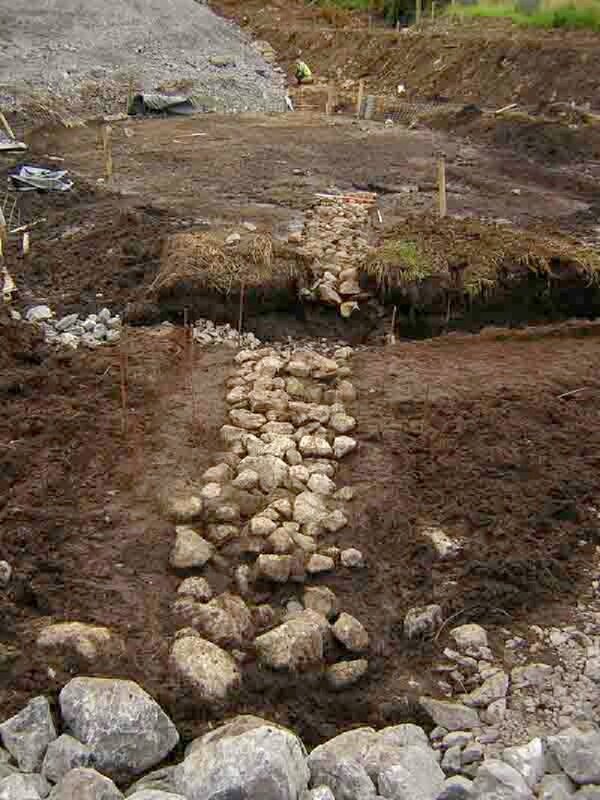 During the monitoring phase, some areas of peat close to the fulacht but outside the fenced off area were left to be removed during the excavation phase. These areas were carefully stripped by machine using a toothless grading bucket. Some 10m to the west of the original stone feature on the north side of test trench 4 from the monitoring phase, a second line of stones was uncovered. This was cleaned and recorded, and incorporated into the excavation area. 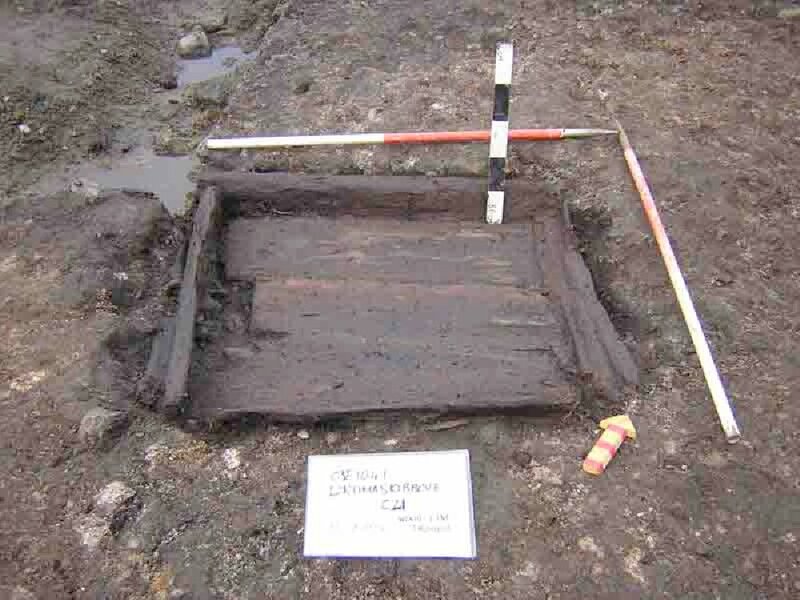 The site pre-excavation thus comprised the burnt mound, with a wooden trough at the summit, generally dipping gently to the north and disappearing beneath a layer of peat on which two roughly parallel linear stone features were set. C5 was the eastern of the two stone features at the northern edge of the site. It comprised a band of rounded stones composed of a white to creamy banded metamorphic rock, probably schist. The feature was between 0.9m and 1.05m wide, running a total length of 14.9m. It was set into C8, a peat similar to C3 but less homogenous, with frequent lenses of sand running through, which lay directly over the burnt fulacht material (C6). In section the cut of the stone feature (C10) was a shallow ‘U’ shape and cut both the peat C8 and C9, a very compact and fine sand comprised largely of quartz and mica which gave it a light brown to grey colour, at the base. The ‘U’ shape and the use of a hard base material led to the conclusion that this was a path deliberately built into the firm sand to allow passage across the bog. A single peg with a worked end was found lying on top of the path (find 1). This feature lay 5.7m to the west of C5 and some 0.1m-0.15m below. It was also a line of stones, similar in nature and orientation to C5 although the stones were slightly smaller, a maximum of 0.2m in either dimension. At its widest point the feature was 1m and at its narrowest, 0.7m. The surviving section however was considerably shorter than C5, only remaining on the northern side of test trench 4 for a length of 2.5m. Again the section showed a shallow ‘U’ shaped profile to the stones and the base of the cut (C14) was again more solid than the peat although this time it was another lens of material within the C8 (the peat). 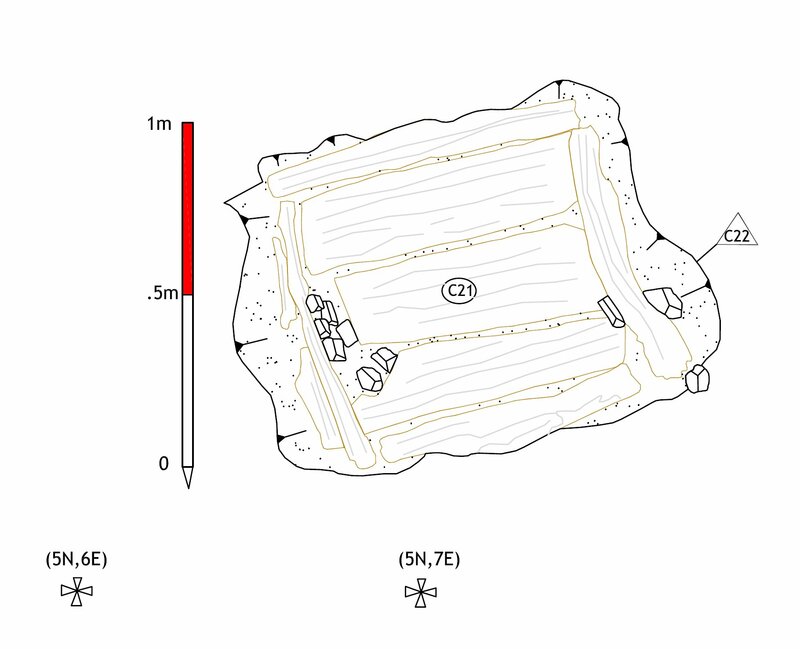 Methodology; the burnt mound was cleaned and recorded, then divided into four quadrants, centred a point slightly to the south west of the visible wooden trough (trough 1, C21).The quadrant sections were removed one by one and the resulting profiles through the mound drawn. After the recording and removal of the two stone pathways and the natural deposits below, (C8 and C9 the peat and interbedded sand) it became clear that the burnt mound (largely C6) extended some way beneath the former line of the pathways. At the very northern edge of the mound, the burnt material began to dip very sharply beneath the thickest layer of peat. This trough was situated at the summit of the burnt mound, slightly off centre toward the south east. The top fill, C18 was charcoal rich, burnt and shattered stones up to 0.05m similar to C6 but also with some silty clay. Beneath this C19 was similar but with larger stones, up to 0.1m and some peat as well as less humified plant material similar to that found between the stones of the pathway. The wood lining of the trough itself consisted of four side planks arranged in a square around three base planks orientated WSW-ESE. The western side board was propped from the outside by two other wooden pieces which may have once been a single element. The timbers in general were well preserved. No joints were evident nor were the planks tightly fitting, implying either shrinkage of the wood or the generous use of a clay lining. The cut of the trough (C22) was sub square with generally steep sides and a flat base, only slightly larger than the trough, measuring a maximum of 1.25m from ENE-WSW and 0.97m SSE-NNW. 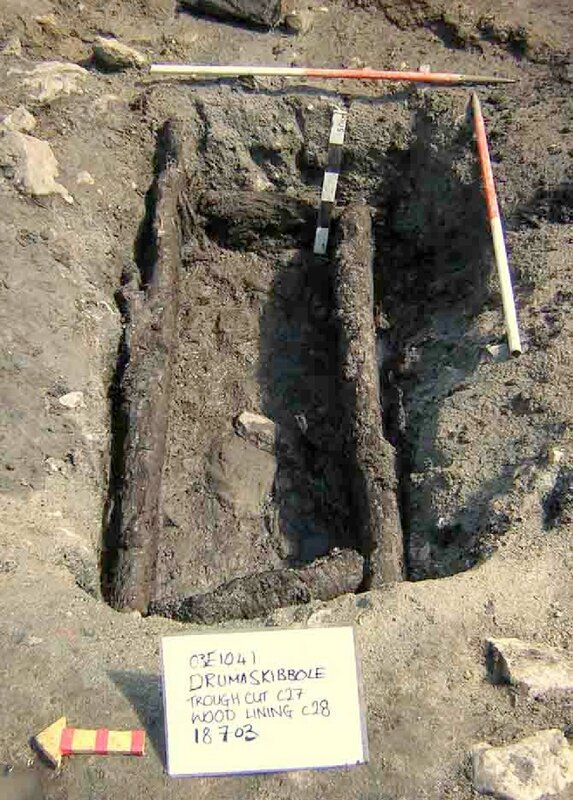 The second trough to be uncovered on the site was in the south-western quadrant of the burnt mound on the southern arm of a horseshoe shape of C6 the charcoal rich fulacht material. Here a keyhole-shaped pit (cut C27) oriented roughly east west was cut into the natural white marl C26. The sides were gently sloped at the top but becoming sheer and almost vertical towards the base, except to the north where they were steeply sloped. The fill was a dark charcoal rich material of heat shattered stones and ash (C29), broadly similar to C6. The base of the trough was uncovered at a depth of about 0.3m below the surface. Four thick wooden planks (C28) were set, on their sides, into slots in the natural to form a rectangle, with the long axes orientated approximately WNW-ESE. The entire structure was roughly 1.8m long and 0.8m wide. There was no wooden base. At the WNW end, the end plank was held up by a wooden peg set into the natural. The planks were relatively thick ranging from 0.3m to 0.6m. Compared to trough 1, this feature was relatively coarse, the planks were far thicker and rougher hewn and there was no base. As with trough 1 there was no evidence of any jointing, the sides being presumably propped and lined. The trough lay beneath the current water table as cut C27 was prone to filling naturally from the ground. During the last days of excavation an unusual feature appeared on the very northern edge of area 1 (7.80E/11.10N marked its southern tip). As the last of the peat below the fulacht was being removed a particularly dense concentration of wood was encountered. After more careful excavation and subsequent examination it was discovered that this wood was worked. This context, C39, consisted of three radially converted planks surviving as four elements. They measured: 1.24m x .20m (El#1) ; .69m x ..16m (El#2); .46m x .14m (El#3) ; .19m x .08m (El#4). These planks were laid in a semi-circular cut which sloped downwards from south to north. The base and walls of the cut were the natural white marl C45 and the planks followed the contour of the pit tongue and groove style. To the east of these planks, a row of contiguous hazel rods in an upright position (C38) seemed to mark the edge of the feature. These branchwood elements were of uniform size surviving to a height of 30cm and a median diameter of 3cm.The total length of this part of the feature was 1.14m. There was one longitudinal element woven through the top of the vertical rods. As an attempt at wattling this seemed at best perfunctory but it was actually all that was needed to secure the posts as they were driven into the space between element # 1 of C39 and element #5 in the next part of the feature to be uncovered, C41. When the peat to north east of the hazel rods C38 was taken down it was discovered that the rods had not marked the end of the feature but rather served as an internal marker of some kind. Five unconverted roundwoods (C41) lay under the peat surviving as ten pieces. The largest of these (El#5) measured 1.3m x .20m. while the shortest(El#9) measured .34m x .19m. they were aligned in a SE/NW orientation in accord with the planks to the west. Although they were all broken only elements 8 and 9 at the northeast edge of the feature were in poor condition. These elements served to extend the feature into a sub-circular cut. 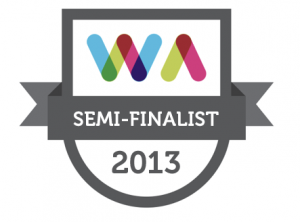 This entry was posted on Wednesday, May 6th, 2009 at 11:55 am. 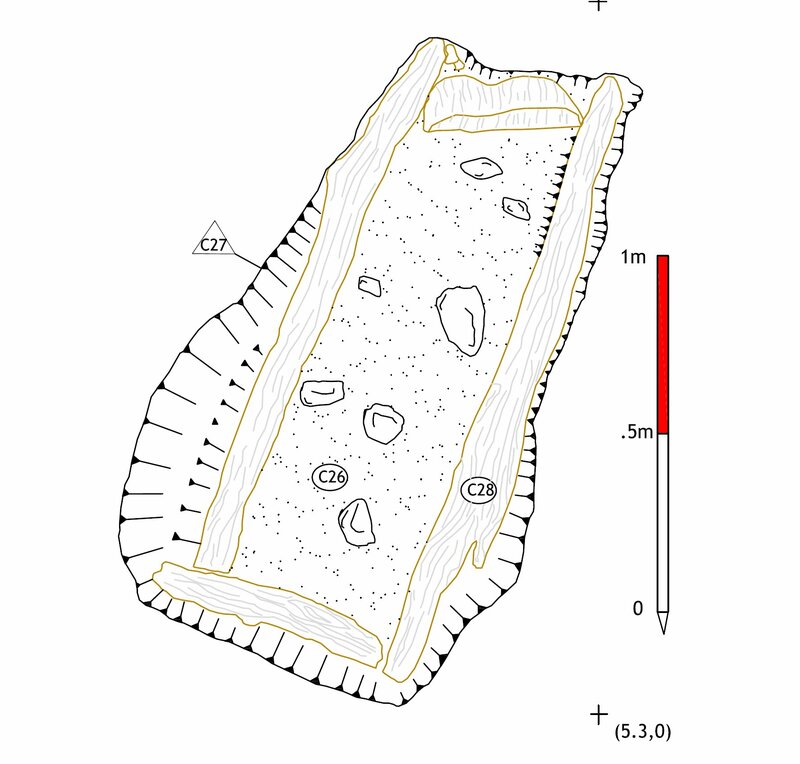 It is filed under About Archaeology, Fulacht fiadh, Papers & Reports and tagged with archaeological consultants, Drumaskibbole, excavation, excavation report summary, Fulacht fiadh, irish archaeology, pathways, sligo. You can follow any responses to this entry through the RSS 2.0 feed.